I love scrapple ! I was raised on it. There was scrapple festivals, go to an auction and you would find a scrapple sandwich. Took a pig to the butchers ,you would be sure to have scrapple in with the rest of the packages of pork . 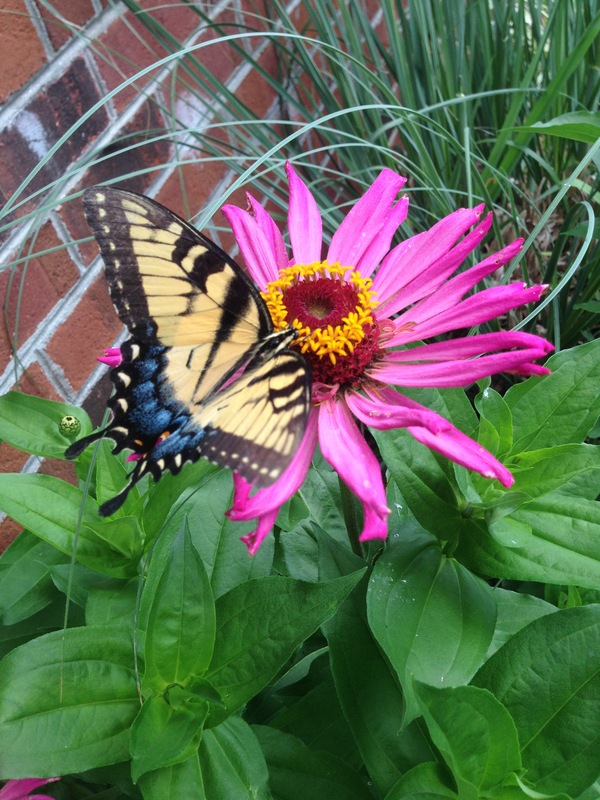 Then… I married and moved from the eastern shore to Ga.
That’s when I decided to make my own.. I soon learned there are two kinds of scrapple,one made with a little pork and cornmeal, the other one made with everything but the squeal ,a little cornmeal,and buckwheat flour. Cookbooks had no good recipes, for the family didn’t like the cornmeal flavored scrapple. So for years, I searched for a good ol recipe. Then one day on my iPad I pushed in eastern shore scrapple, to my delight two popped up . Here’s the one I tried..
Abstacted from _Thirty Five Receipts From “The Larder Invaded”_ by William Woys Weaver, The Library Comapny, 1986, Philadelphia. 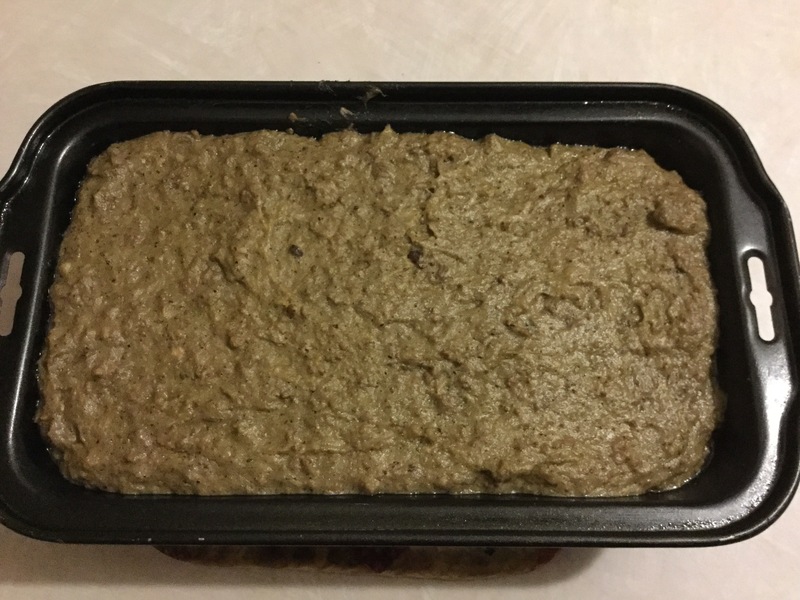 Scrapple is a medieval dish, a sort of a pot pudding that evolved… In Wesphalia and northern Holland, the region where Philadelphia scrapple evolved, was thickened with blood and buckwheat flower. In Philadelphia, unfortunately, blood had a commerical value in the processing of sugar and was far too valuable for the likes of scrapple. The buckwheat was cut in half with cornmeal, allowing even less ground meat per pound of scrapple than its European counterpart. It was no longer in the haute cusine category. Note: a pigs haslet is the heart, the liver and other edible viscera of the animal. I had alway thought that scrapple was made of the meat of the head of the pig. Of course this would be considered offal meat: the jaw and face meat (not the brains). The seasoning used were sage, salt, pepper, and cloves. Here is an up-do-date adaption of Elizabeth’s Nicholson’s receipe. Simmer the meat in the water about 4 hrs until tender. Strain and reduce broth until it is about two quarts. Grind the cooked meat and fat in a meat grinder and add it to the broth. Add the cornmeal, the buckwheat and the seasonings and simmer until thick. Stir often to keep it smooth. Add water if necessary. When it has the consistancy of mashed potatoes, pour batter into six inch bread pans. Allow to stand until cool, and then refrigerate overnight. This recipe was a hit in this household!! Since it has been cold , it is butchering time.. Hams, sausage and so forth until it came time for the scrapple making. Here are a few pictures on how I do it . 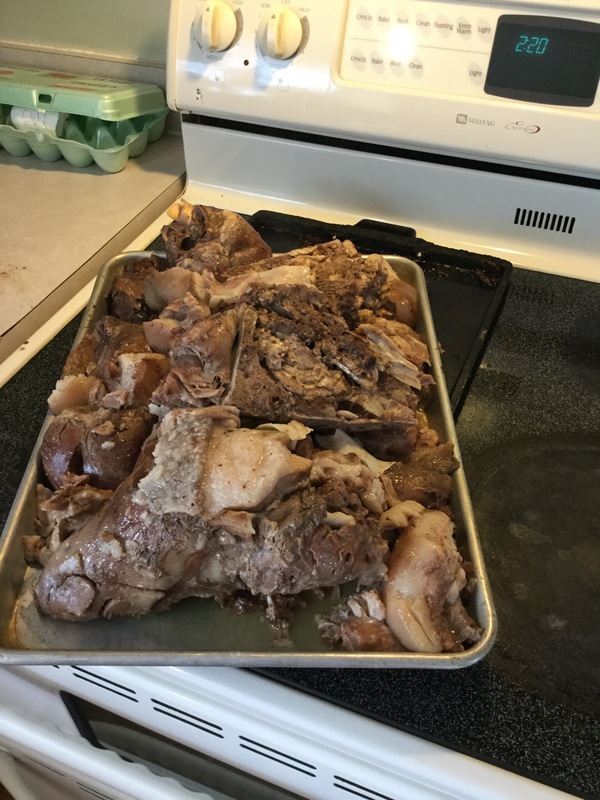 Clean the head,heart and kidneys and fatty scraps of meat,put into a heavy kettle for it needs to cook for awhile ,the more meat the longer the time. 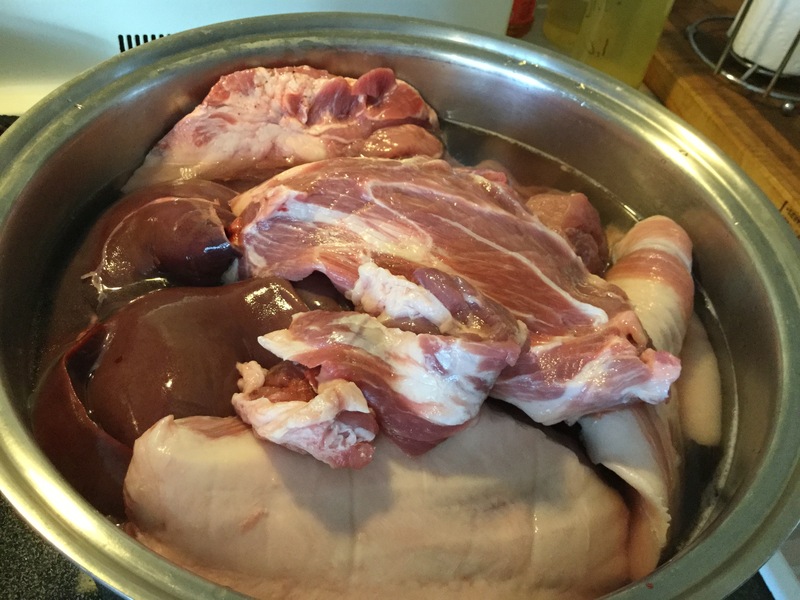 You want the meat soft,when the meat is soft than add the liver to the kettle ,cook until the liver is done( about twenty minutes.) put meat on cookie sheets to cool. 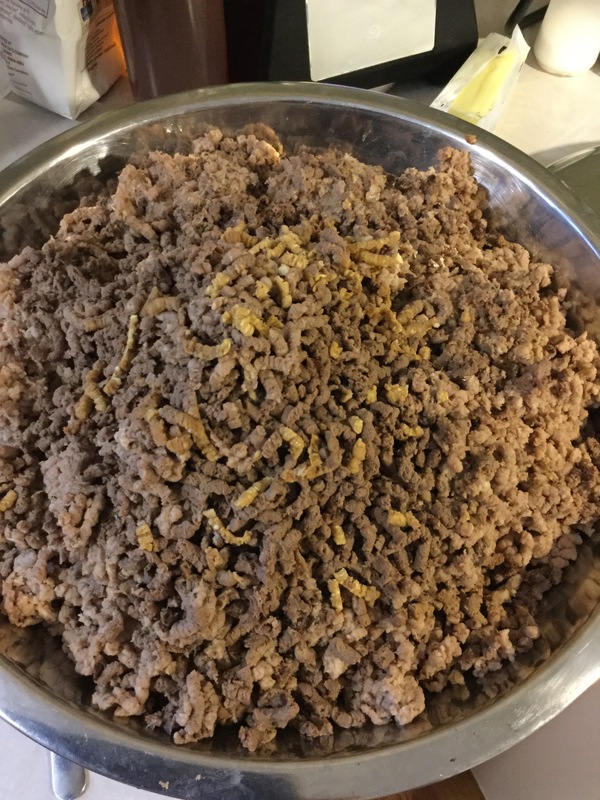 Then put meat and fat though a grinder,the yellow looking crumbles is a bread slice that I put though last to clean out the grinder. 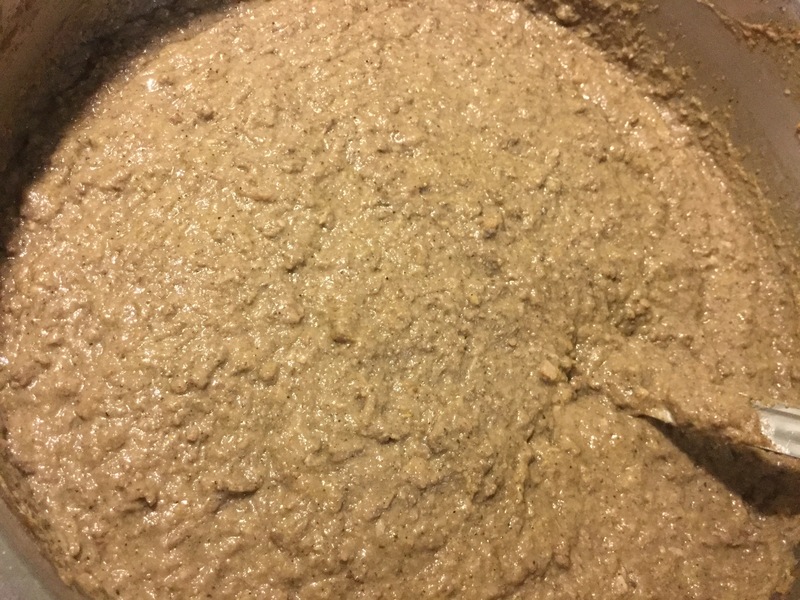 I save some of the broth to make a paste mixture out of the cornmeal and buckwheat flour so it doesn’t get lumps in it, when the paste is smooth, add to the kettle ,turn on heat, stirring often.Here is a picture of it almost ready for the pans. Here’s one pan ready for the frig. 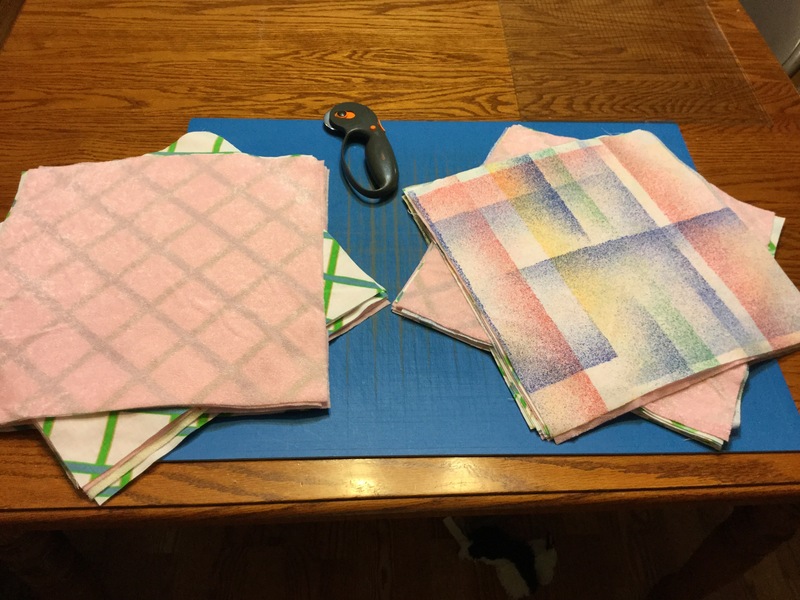 I think I’ll add this border on to the bear paw quilt for Mama in law. 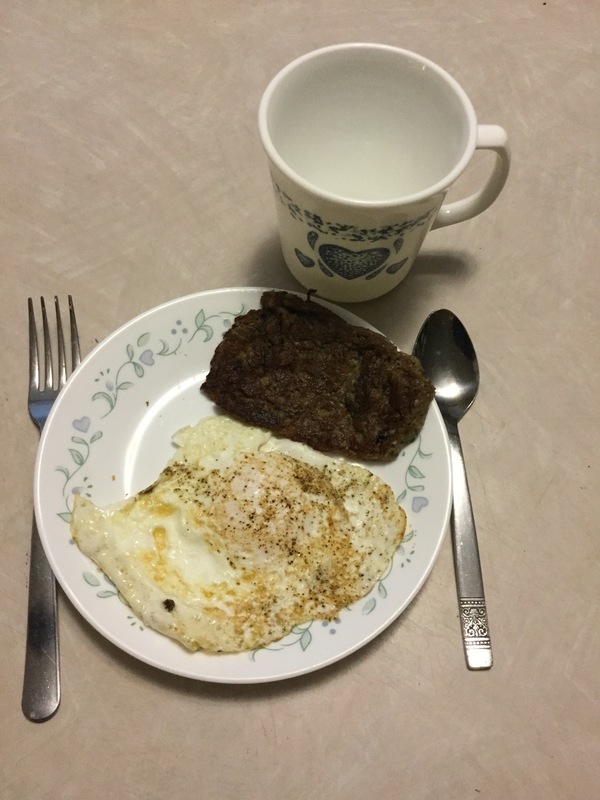 This entry was posted in Uncategorized and tagged butchering, scrapple on January 27, 2016 by Deb. I have a finish up , an hurry up and a waiting to be done, on my list. 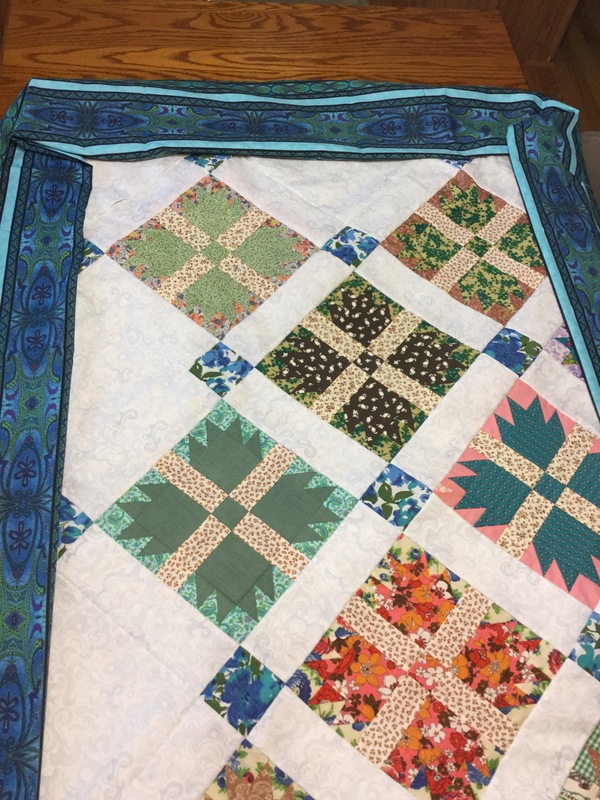 Then I remembered that I needed to get busy on the top that I was making for my mother in law using her mothers scrap fabric. I want to work on this one really hard for Mama is 77. 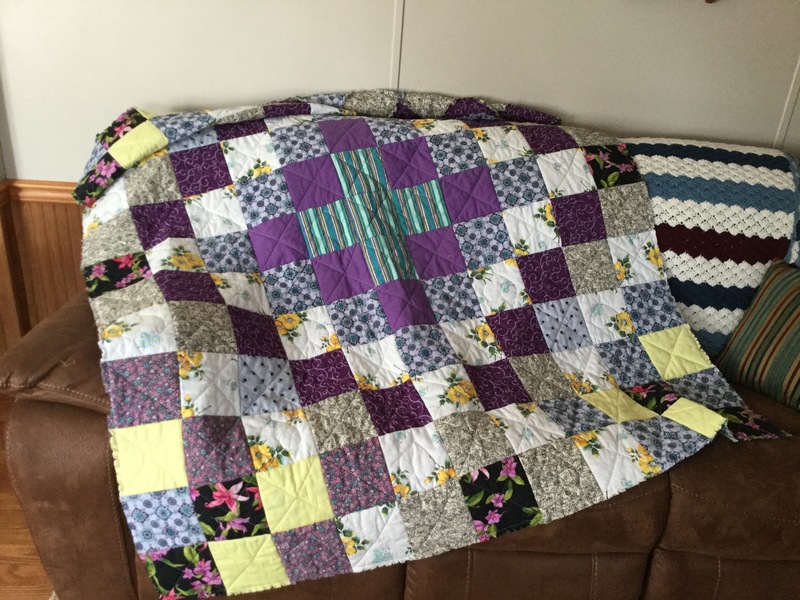 That is the hurry up one that’s to be completed..hand quilted included! 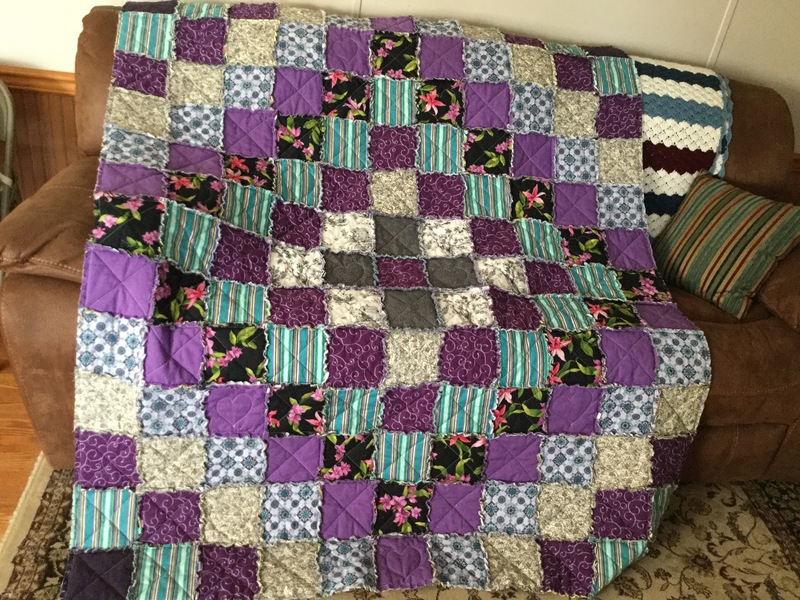 It is half way pieced. 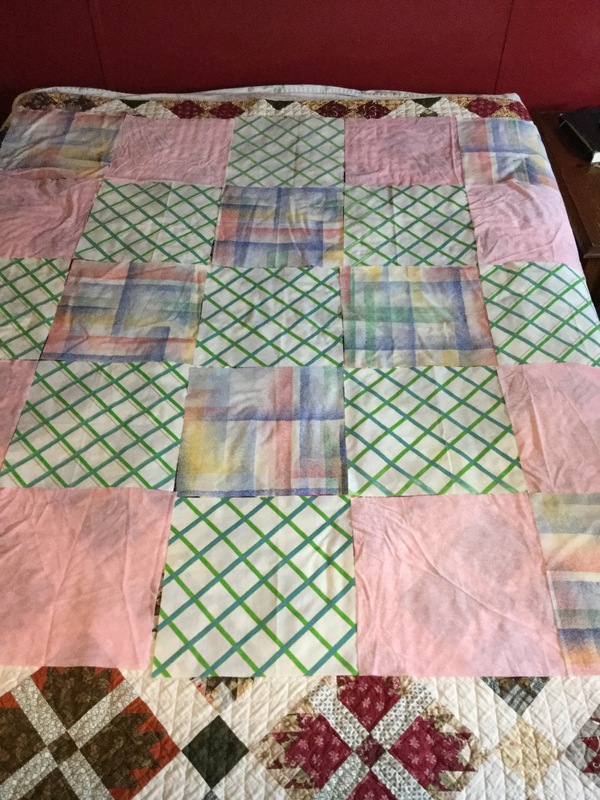 And the one waiting to be pieced…. 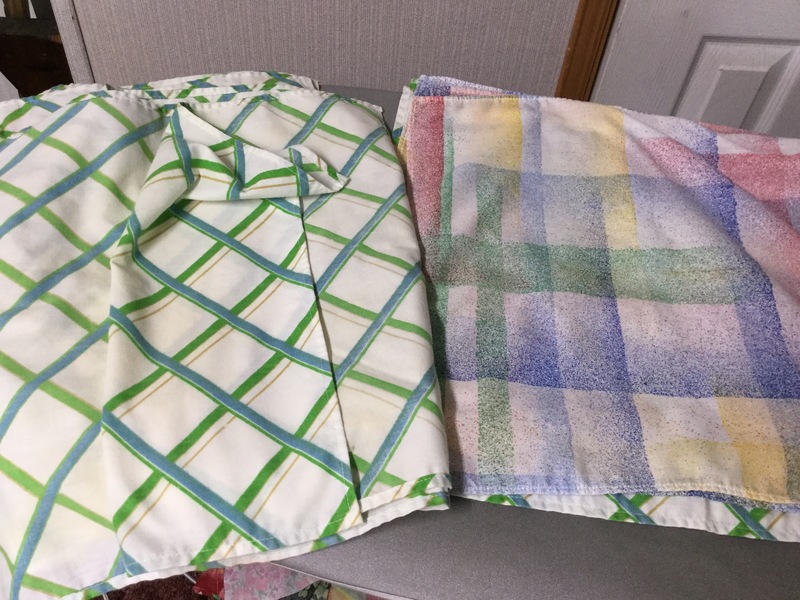 My daughter in law gave me those pieces of fabric ,that she came across knowing I would use them somehow. I was able to get 12″ blocks cut from the pieces. 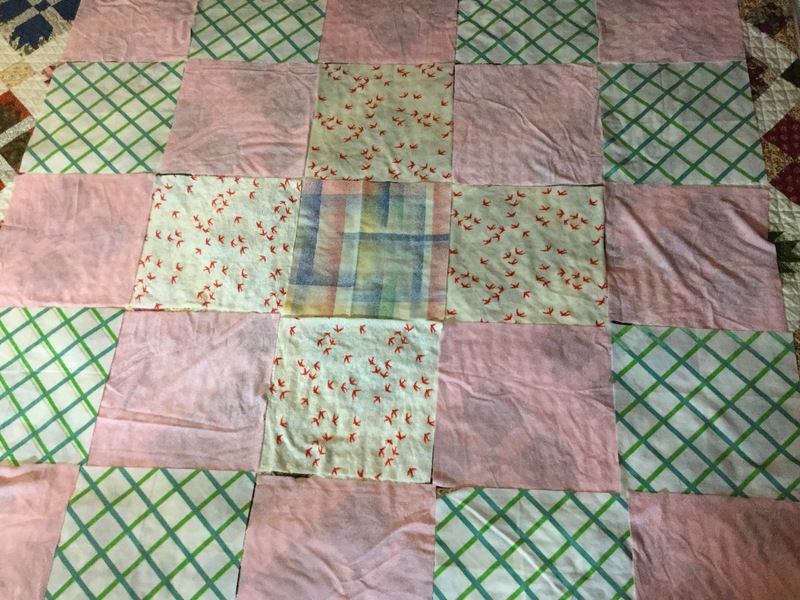 I want to make a rag quilt out of this . I laid the top and bottom out on the bed. I stacked them like this until I sit down to sew them. 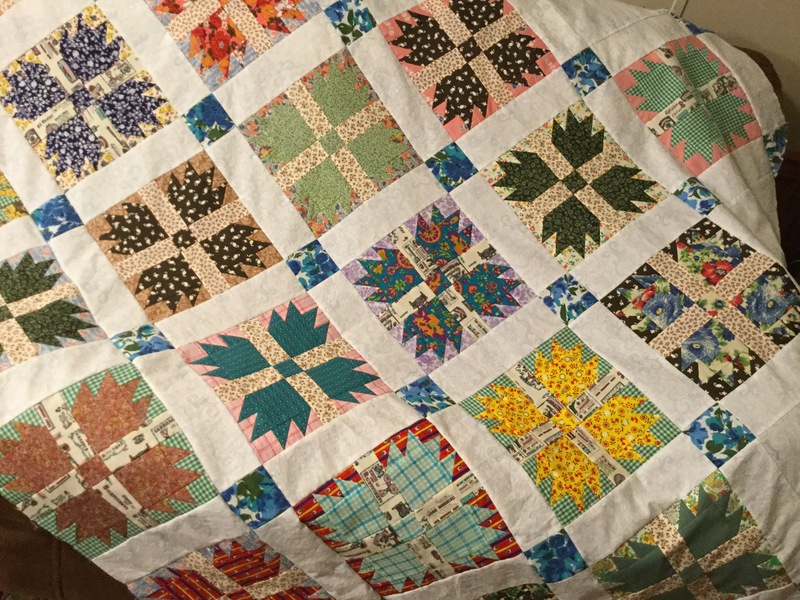 This entry was posted in hand quilting, quilt, scrappy quilt top, sewing, Uncategorized on January 9, 2016 by Deb.